To sensibly prepare the data collection process and to fruitfully process this research data the cbmc-project is guided by specific theoretical concepts and models. In the course of the research project the concepts and models applied will be amplified, extended, and/or modified. Anthony Giddens’ structuration theory highlighting the recursive relationship between agency and structure. These two concepts are combined to create a recursive media market and media company model. 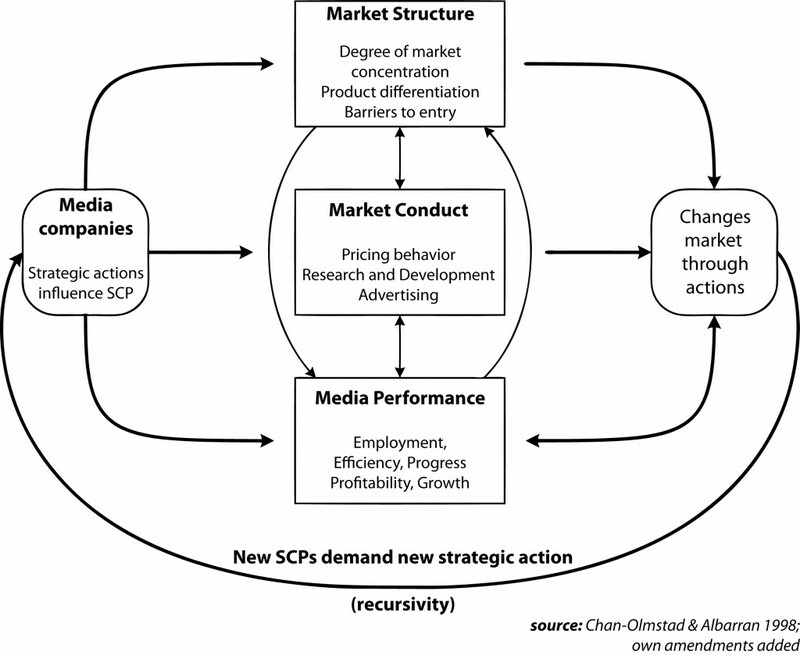 The SCP model helps to understand the relationship between media companies and their industry environment. Still, it neglects the influence of individual entrepreneurial action. Structures, conduct, and performance of markets are related to macro-economic factors. Market characteristics are described on an aggregate level. Thus, the model does not provide information on why individual media companies enter certain markets. It does not explicate the relationship between market structures and company decisions. Though, the characteristics of a media company, the way it is acting nationally and internationally, the product portfolio it offers, as well as the media manager’s decisions crucially affect the form and intensity of cross-border communication. Combining the SCP model with structuration theory helps to overcome these shortfalls. The SCP model already is recursive as it assumes that conduct influences the structure as well as the performance and vice versa. Still, the recursive media market and media company model extends this recursiveness by integrating the companies into the model: The extended model states that media companies and market structures influence each other. Thus, the model sketches the relationship of two factors that determine the form cross-border activities take: (1) the companies’ strategies, instruments, and mechanisms and (2) the market conditions. Applying the model the third factor determining the form of cross-border activities has to be taken into account: (3) the product features. Consequently, every product type accounts for a separate model-cycle. Now, neither the market conditions nor the companies’ actions are sufficiently differentiated by this model. Therefore, it has to be expanded by models or concepts that (1) help to qualify and characterize the media companies’ strategies, instruments and mechanisms and that (2) pay attention not only to the economic but also the geographic and cultural differences in market conditions. Both are achieved by integrating (1) a concept of four models of cross-border activities by Bartlett and Ghoshal and (2) the distinction of process dimensions of cross-border activities. Strategic actions media companies are able to adopt aren’t random nor emerging out of nowhere. Rather, media companies resort to specific modes of cross-border activities. The cbmc-project refers to these modes as structural modalities. Structural modalities are bridging structure and agency. They sketch the possible modes of action within specific structures. Management practice and literature labels these modes to be different foreign market entry strategies. These might be differentiated by their labels used in practice as well as research: importing, exporting, licensing, franchising, joint ventures etc. They might also be differentiated by using the terms Christopher A. Bartlett and Sumantra Ghoshal introduced at the end of the 80s. Referring to the way companies going international handle their cross-border activities they differentiate between multinational, global, international and transnational organization models. While Bartlett and Ghoshal hierarchize these four models by describing the latter one as being the ‘solution’ overcoming the weaknesses of the former three, their descriptions also serve to systematically analyze how media companies are acting internationally. In the cbmc-project the four models are interpreted as four idealtypical settings of strategic requirements among companies with cross-border activities. approximation vs. distancing: Do intensive relations of exchange between markets exist? And are the transnational activities of a company intensive? Or is there few exchange and little transnational activity? homogenization vs. heterogenization: Are media products homogenized? And are native executives employed? Or are media products differentiated instead and managers transferred from the domestic to the foreign market? comprehension vs. dissociation: Do culturally bound factors in economic processes enable communication, thereby enabling transnational activity? Or are culturally bound factors leading to processes of demarcation? locating these cross-border activities on the three process dimensions between approximation and distancing, homogenization and heterogenization, and comprehension and dissociation.